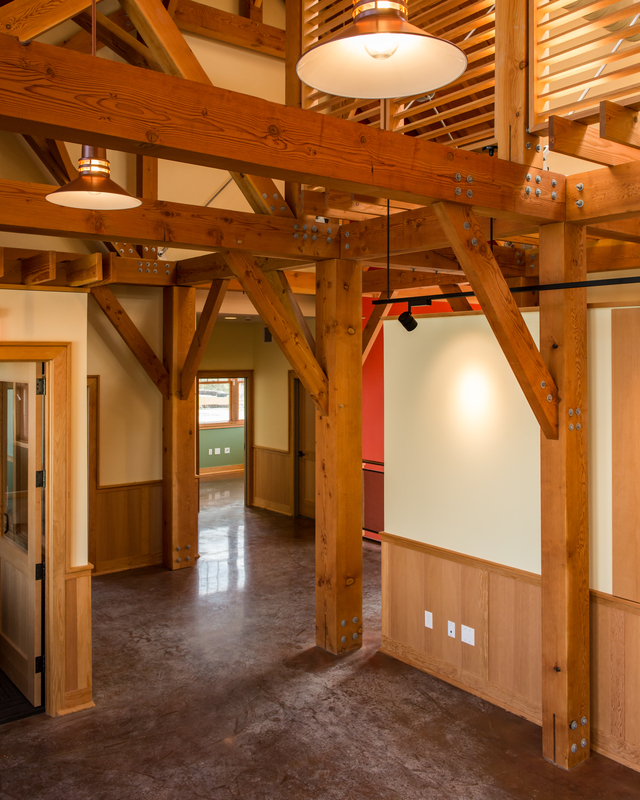 Barns Archives - Hugh Lofting Timber Framing Inc.
FSC® Chain of Custody Certification indicates compliance with high social and environmental standards. 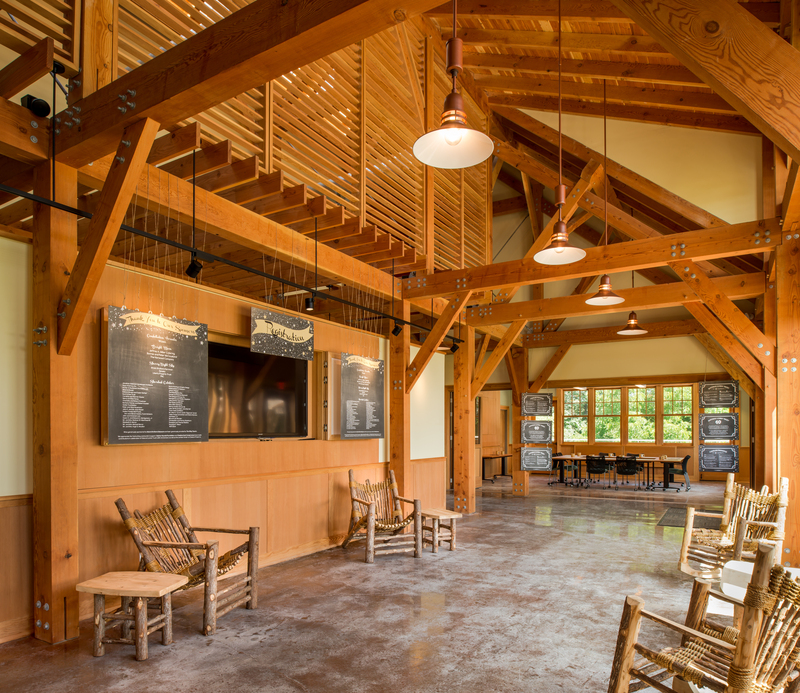 Hugh Lofting Timber Framing, Inc. earned Forest Stewardship Council Chain of Custody certification, indicating products used in its FSC® timber framing projects come from responsibly managed forests. 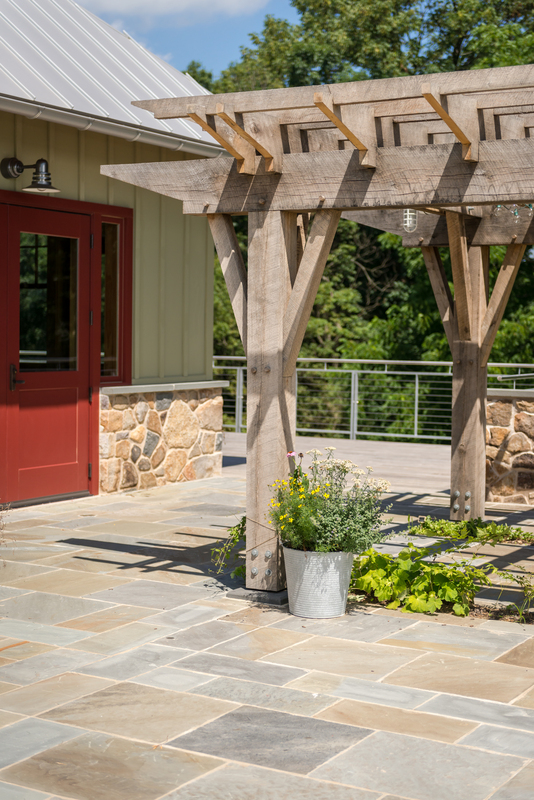 FSC certification indicates compliance with some of the highest social and environmental standards worldwide. 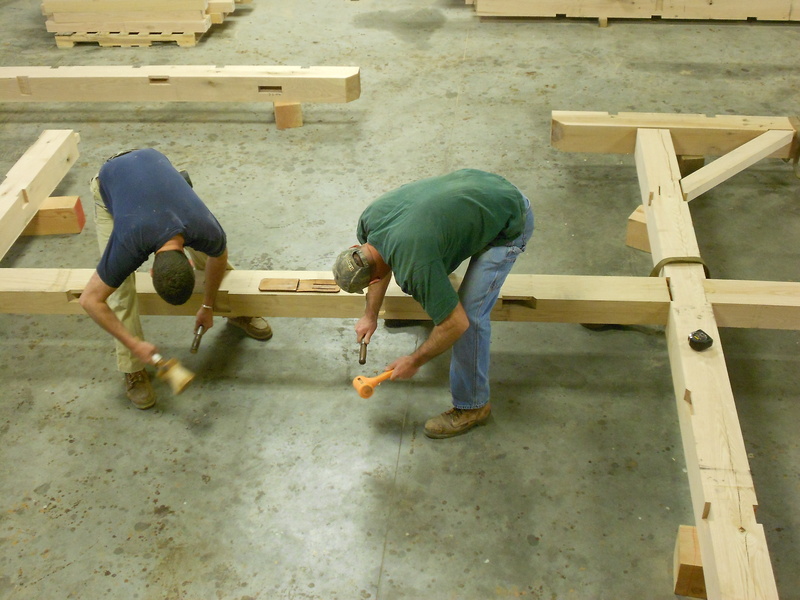 Certified participants promote world forest management in an environmentally appropriate, socially beneficial, and economically viable manner. 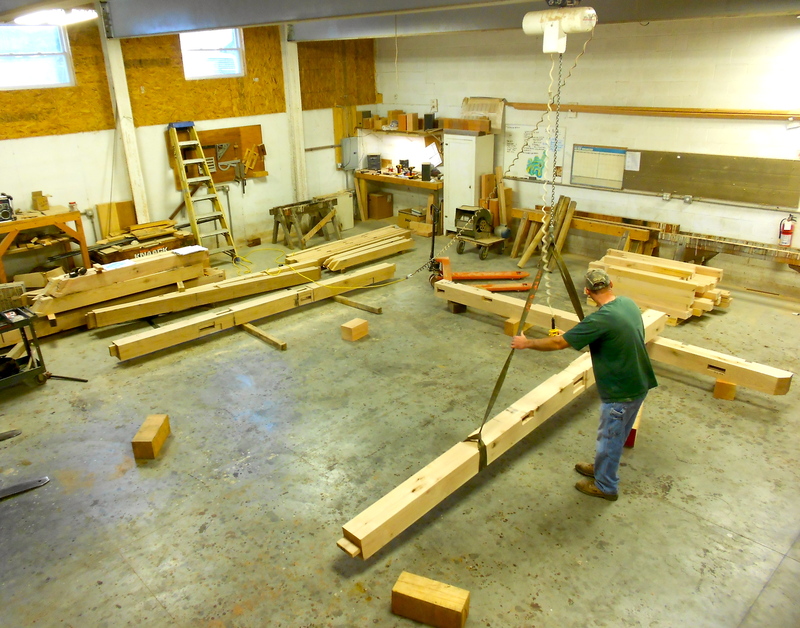 FSC Chain of Custody Certification applies to manufacturers, processors, and traders of FSC certified forest products. 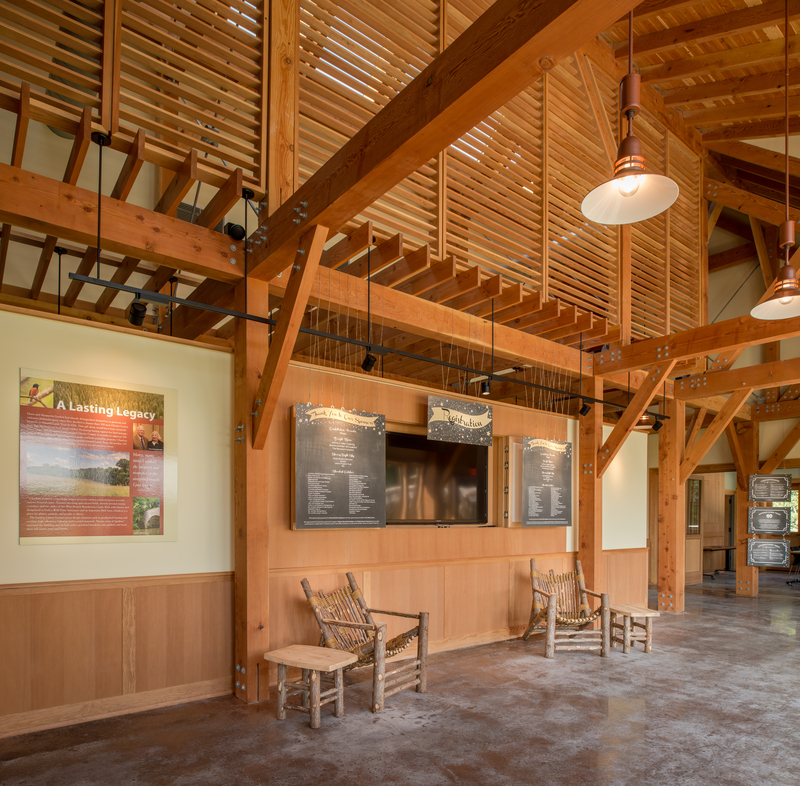 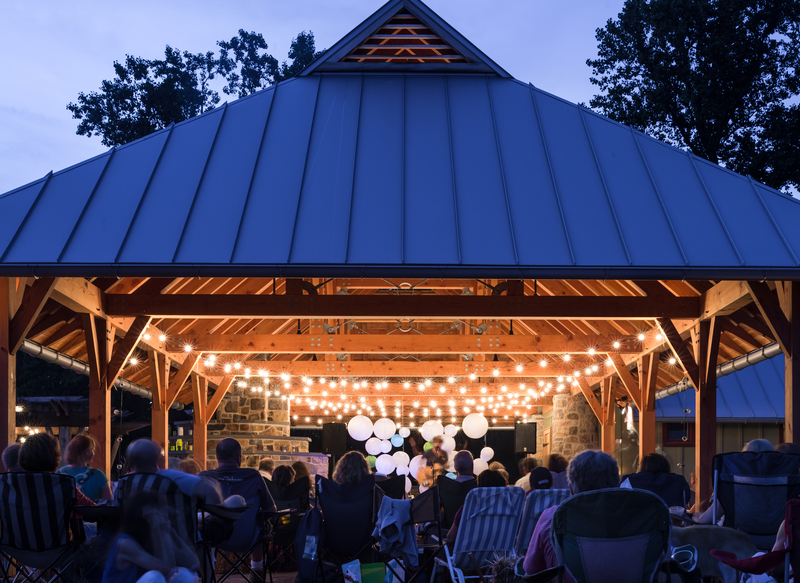 Hugh Lofting Timber Framing, as an FSC Certified Chain of Custody company, joins over 3,400 others in the U.S. who have made this commitment to sustainable wood and paper products. 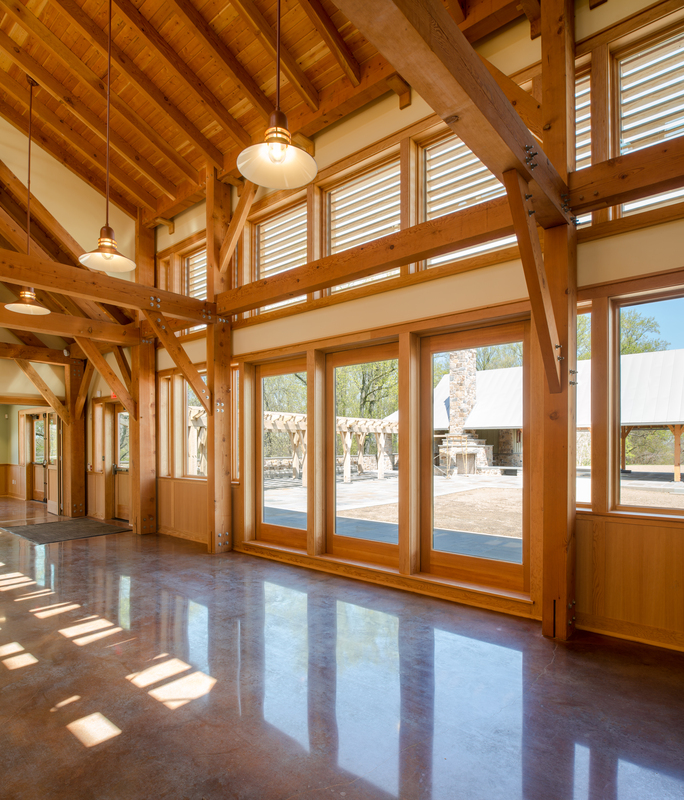 Certification creates an incentive for forest owners and managers to follow best social and environmental practices. 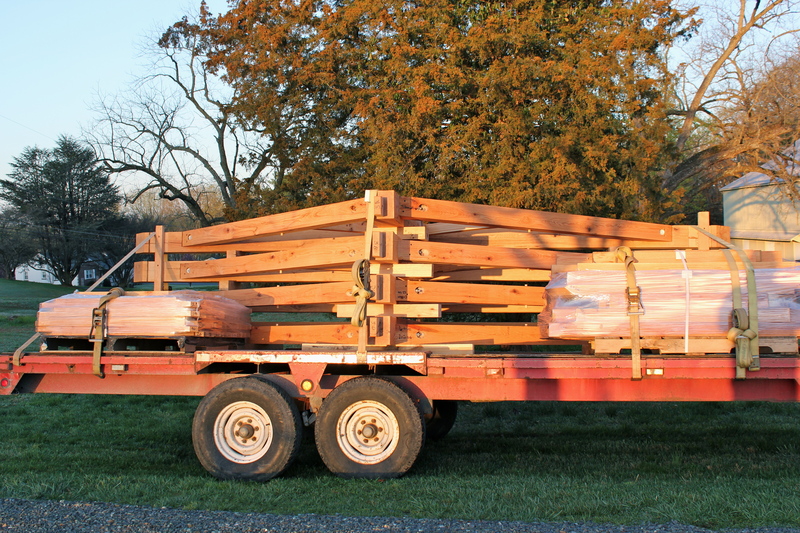 Growing demand for FSC certification indicates that consumers prefer products from well-managed forests. 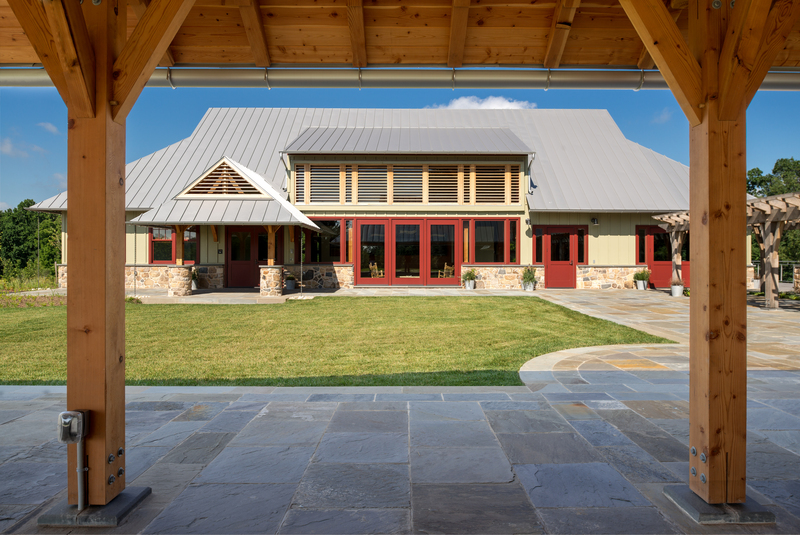 Global benefits of FSC’s certifications and programs including protecting biodiversity, indigenous peoples’ rights, workers’ rights, and areas of environmental and cultural importance. 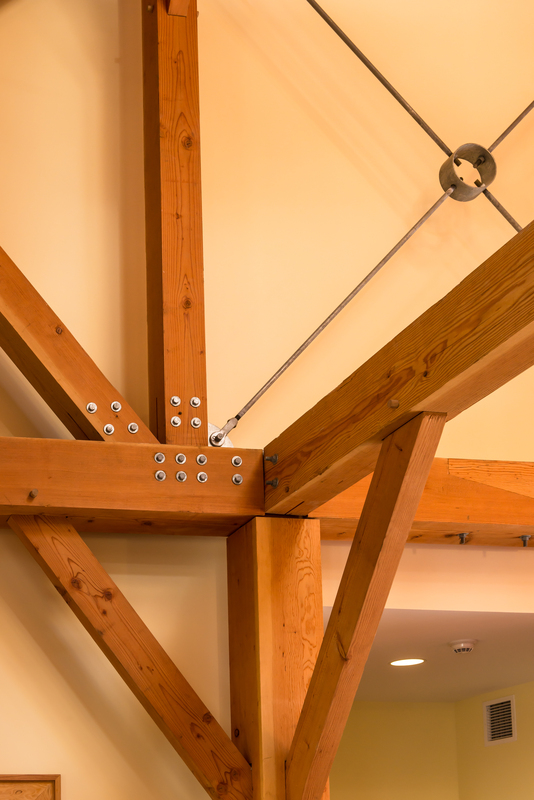 Hugh Lofting Timber Framing underwent a rigorous audit by BM TRADA Certification, Inc. and was found to meet the requirements of standards FSC-STD-50-001 (Version 1.2) EN and FSC-STD-40-004 (Version 2.1) EN for FSC Chain of Custody Certification. 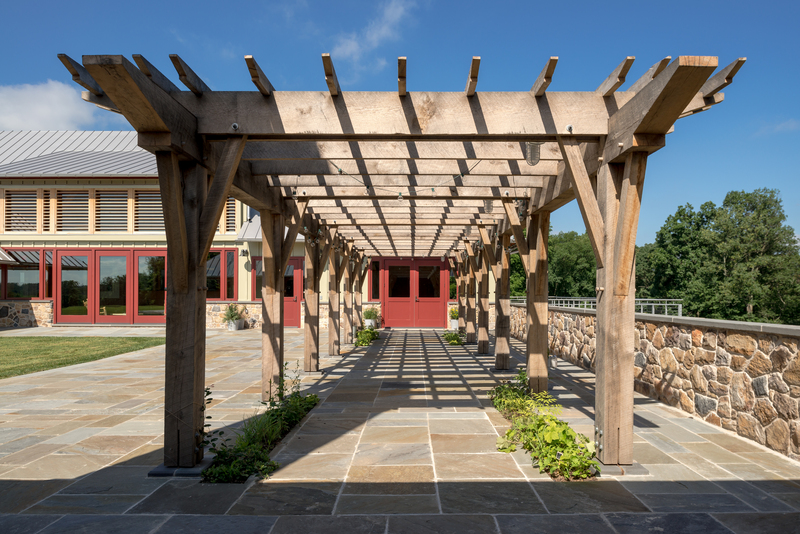 Hugh Lofting Timber Framing is certified in the purchase of FSC certified heavy timber, glue-laminated lumber, and decking for the manufacture and sale of FSC Certified heavy timber, engineered lumber, trusses, decking, structural frames, and roof systems. 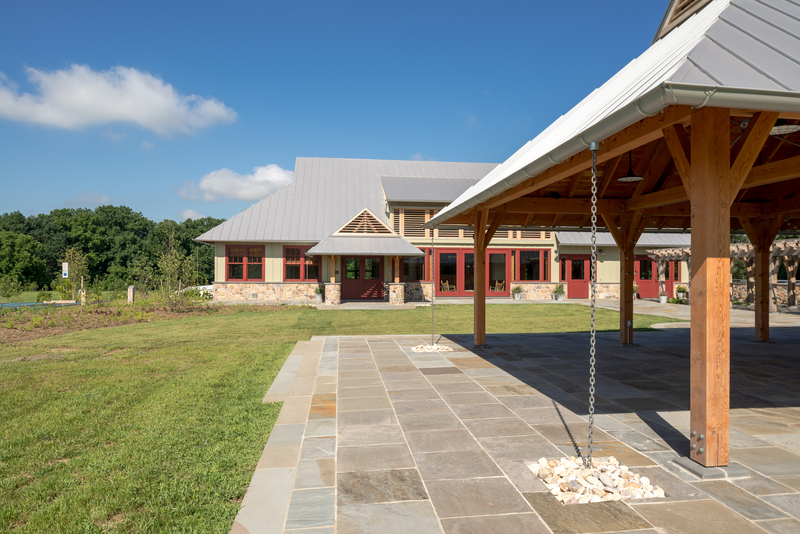 The certification is valid through 2018. 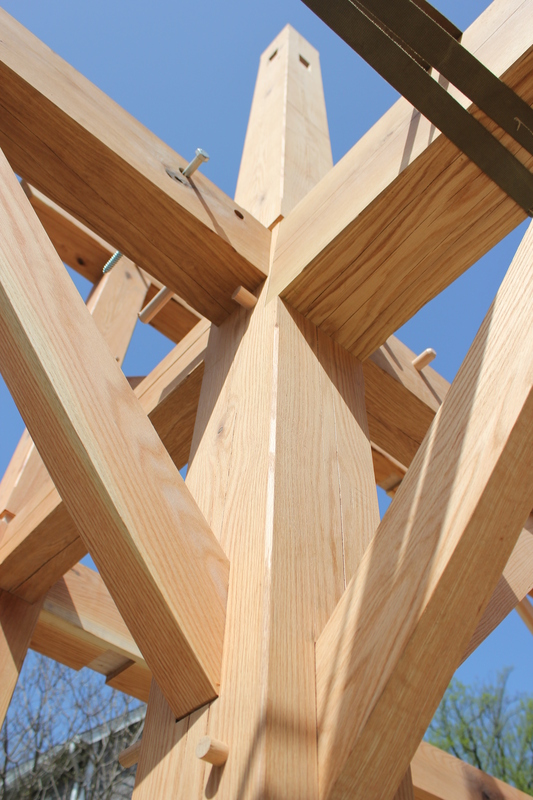 The Forest Stewardship Council (FSC) is an independent non-governmental organization that promotes environmentally sound, socially beneficial, and economically prosperous management of the world’s forests. 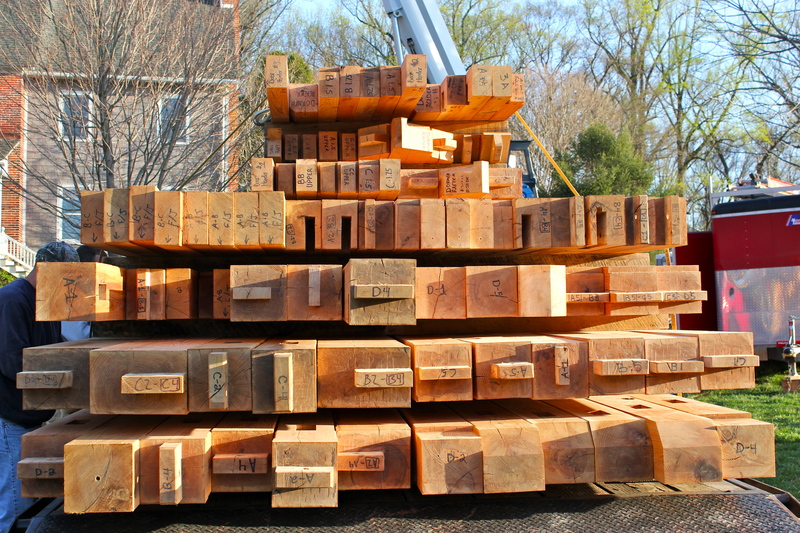 FSC sets standards by which forests are certified, offering credible verification to people who are buying wood and wood products. 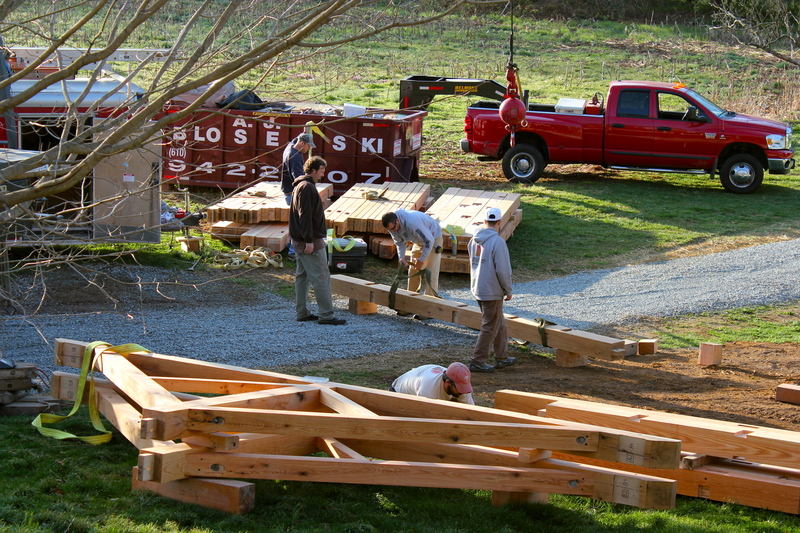 For more information visit www.fsc.org. 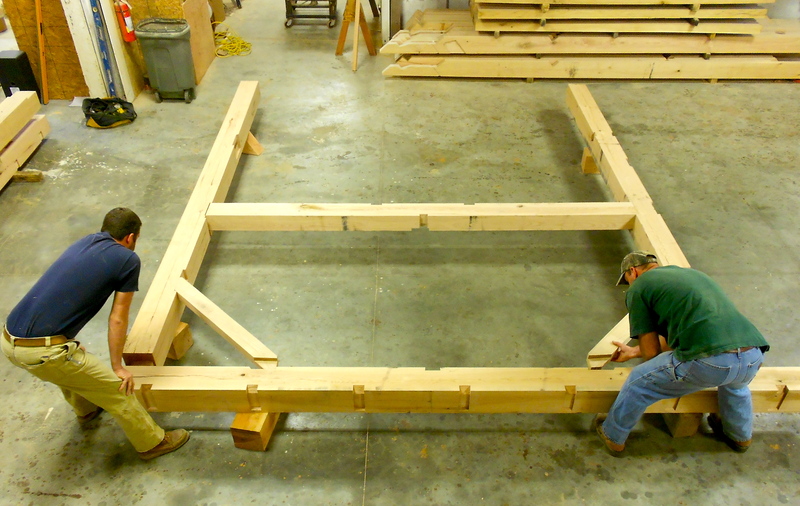 The HLTF crew has been working on cutting and pre-fitting a new barn that will be raised in Virginia. 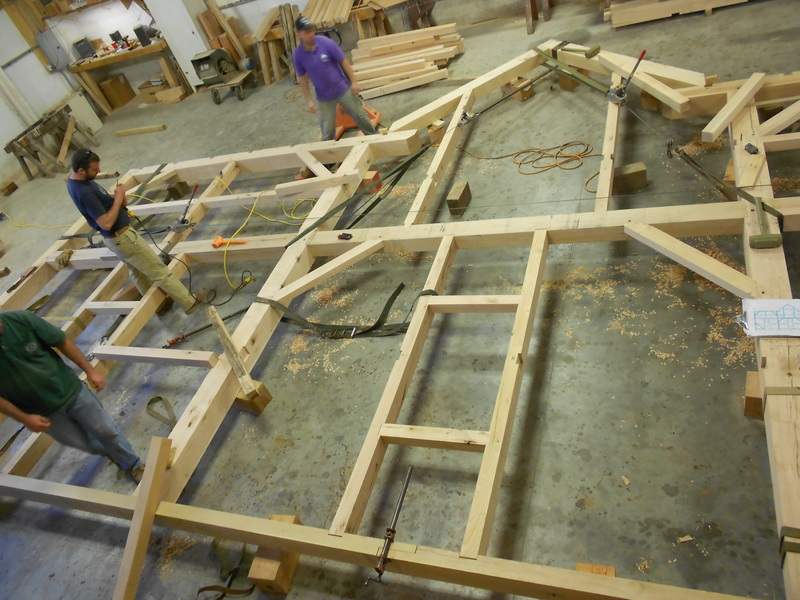 This rough sawn, Oak frame will be raised the second week of August. 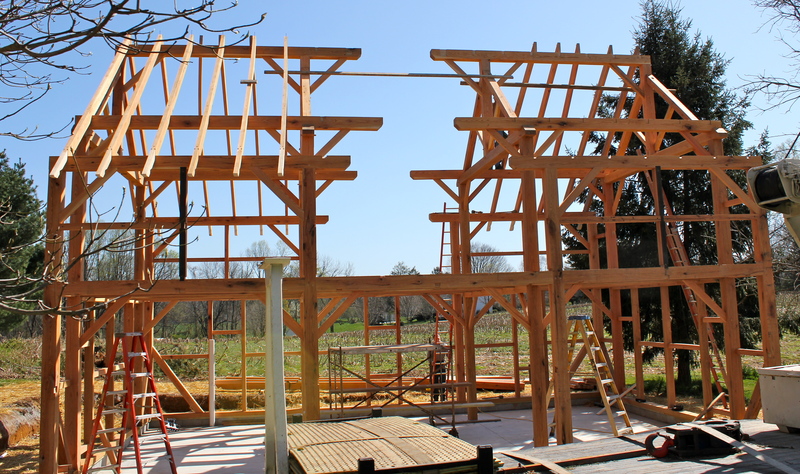 Check back for more shop progress photos! 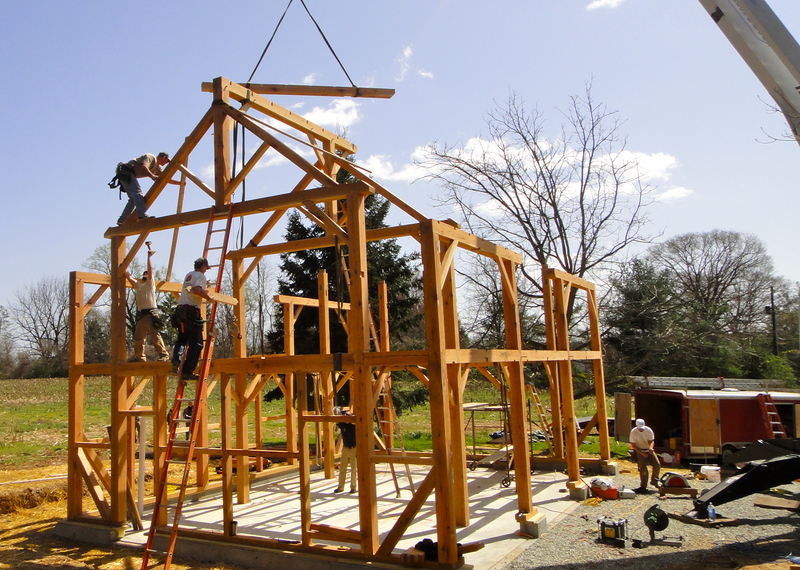 The HLTF crew raised this two-story 24 x 36 timber framed carriage shed in Kennett Square, PA at the end of March. 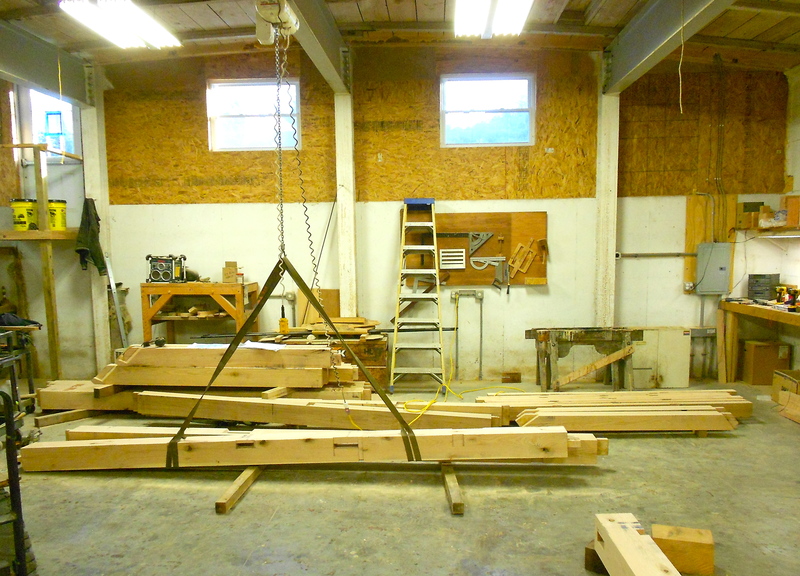 The owners are planning to use their new timber frame as a shop/garage on the first floor and the second as an art studio. 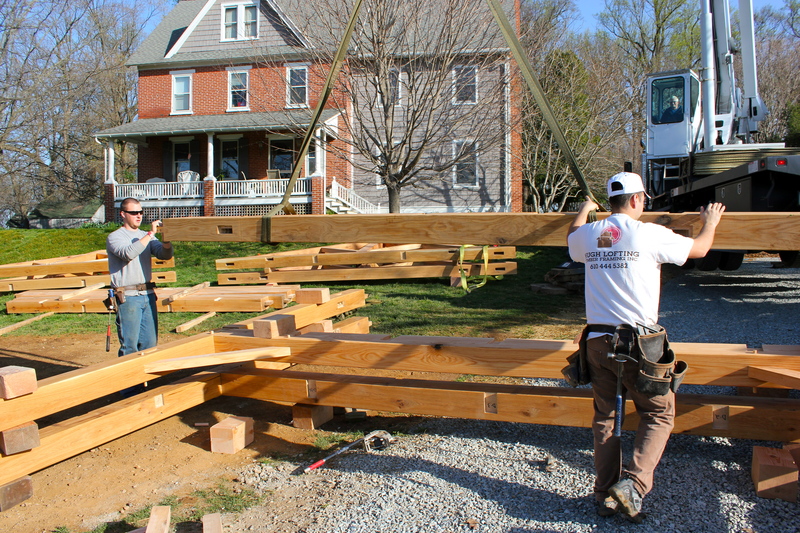 The guys arrived on site early Monday morning with two trailers of timbers and pre-assembled king post trusses. 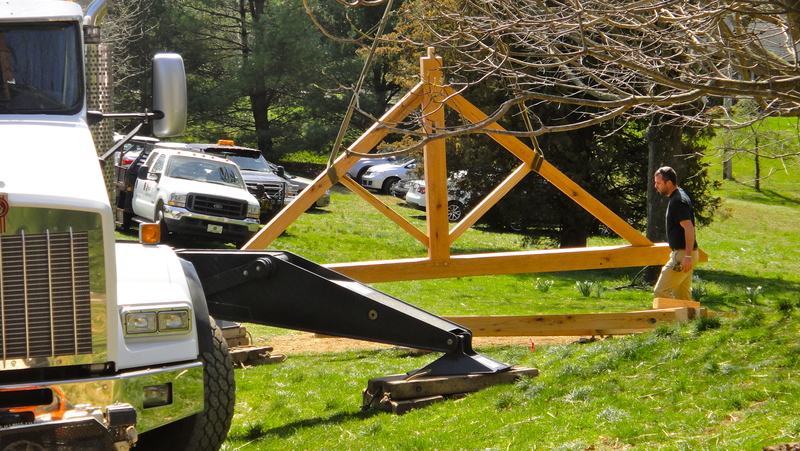 The first order of business was to get the site staged for an organized raising. 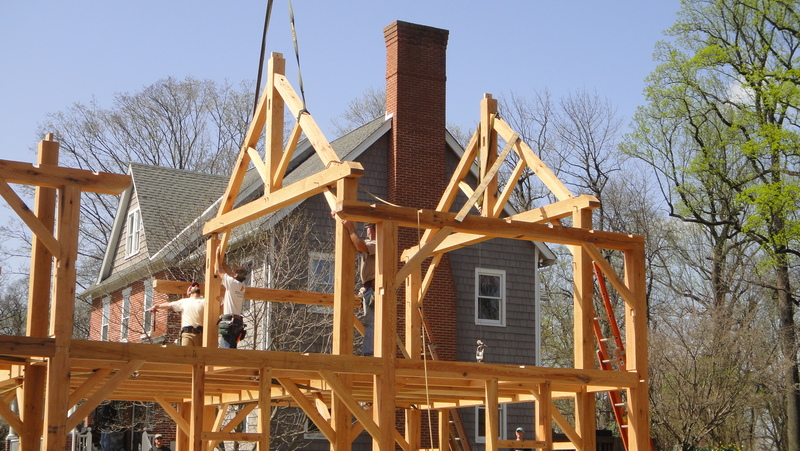 This process includes orienting and setting the crane in the most advantageous position available, designating a timber assembly area and ‘shaking out’ the stacks of timbers. 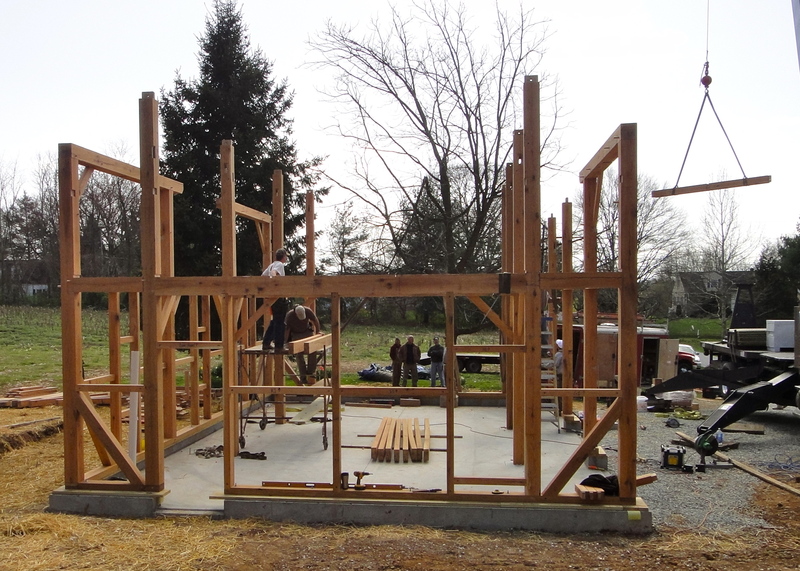 After the stage was set, the crew then built the walls in sections on the ground so they could then have the crane fly them in to place. 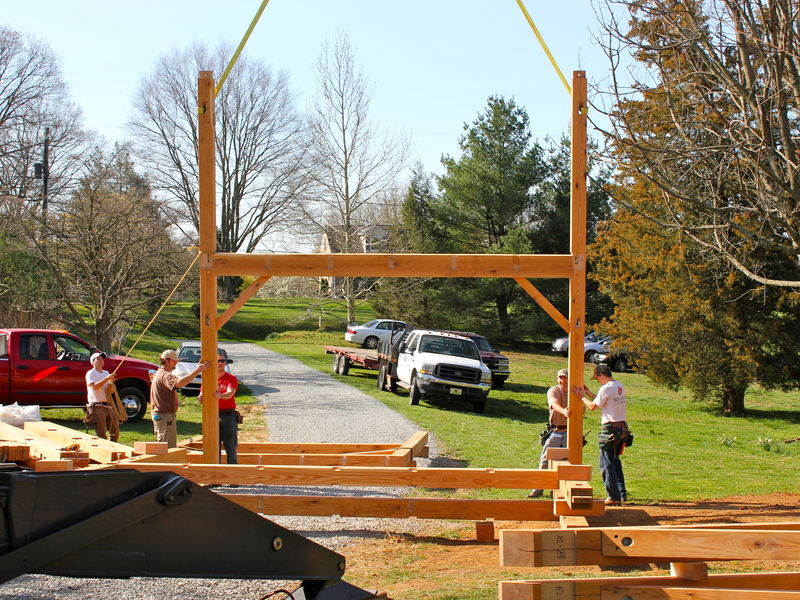 Once in place, the sections were secured and braced off so the crane could fly the next assembly into place. 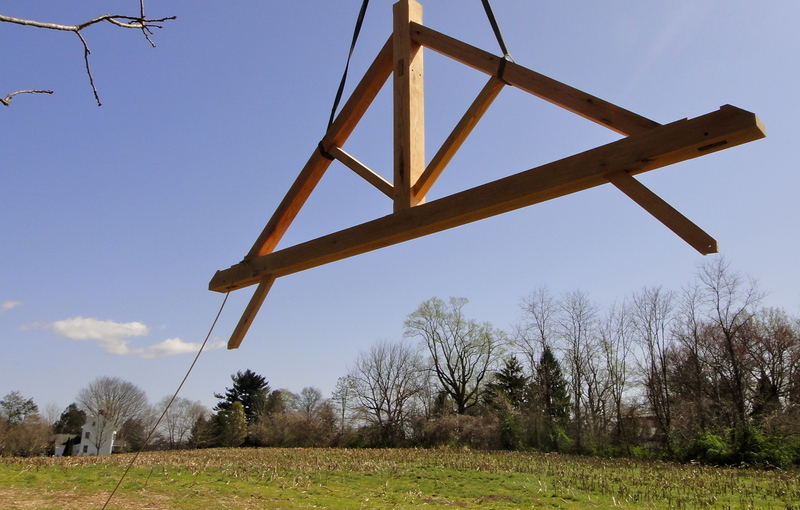 When two assemblies were positioned and braced, the connecting timbers were then carefully installed, plumbed and pegged. 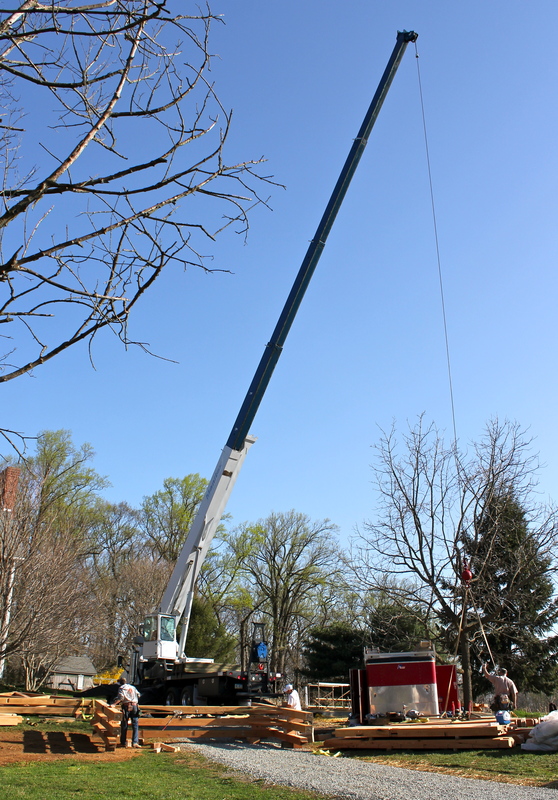 The crane and ground crew worked in concert as assemblies were flown into place the ground crew installed single members growing the frame section-by-section and piece-by-piece. 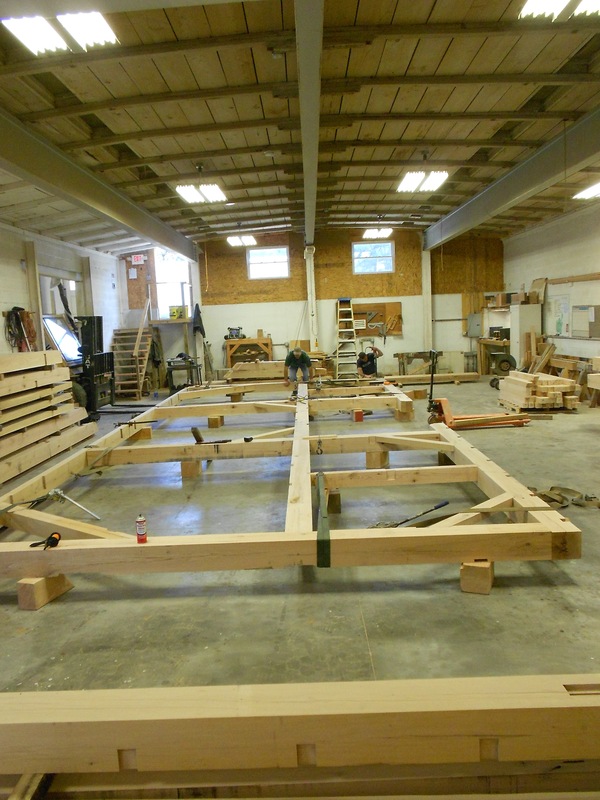 The lower level of the carriage shed will have two bays for vehicles and an extra bay for a garden tractor and workshop. 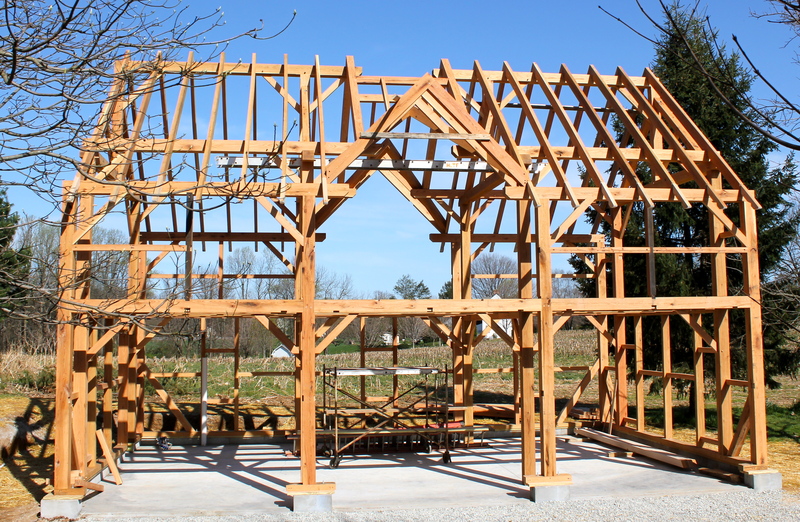 In timber frame construction the entire shell of the building is on the exterior side of the frame so that the timbers can be exposed on the inside of the structure. 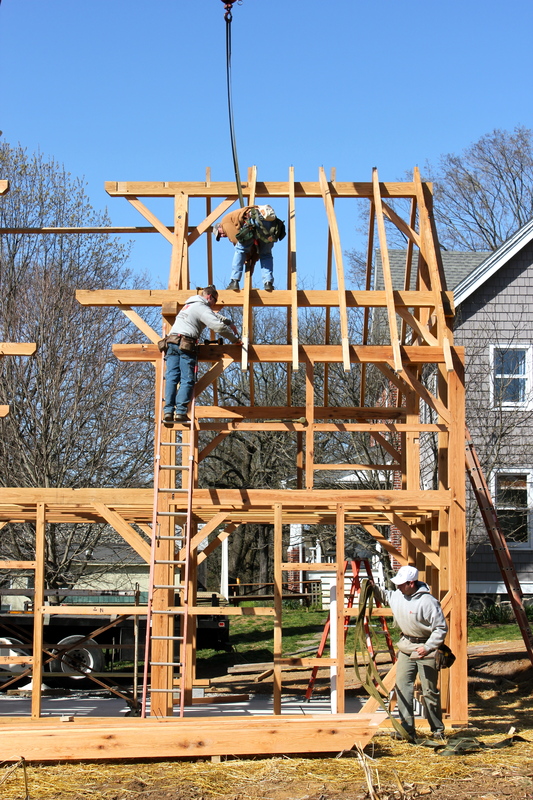 In this case, the posts for the lower level are the same posts that define the studio on the second level. 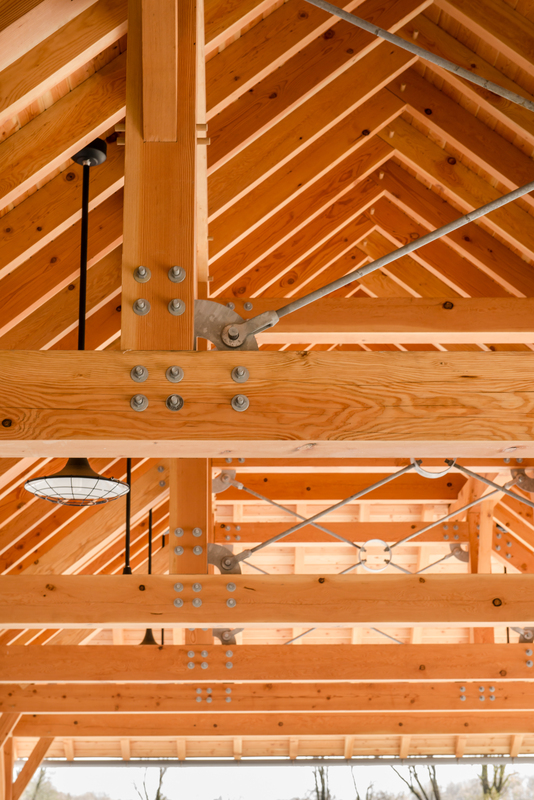 Once installed, the barn flooring and heavy timber floor joists will be the only barrier between the lower and upper levels of the building. 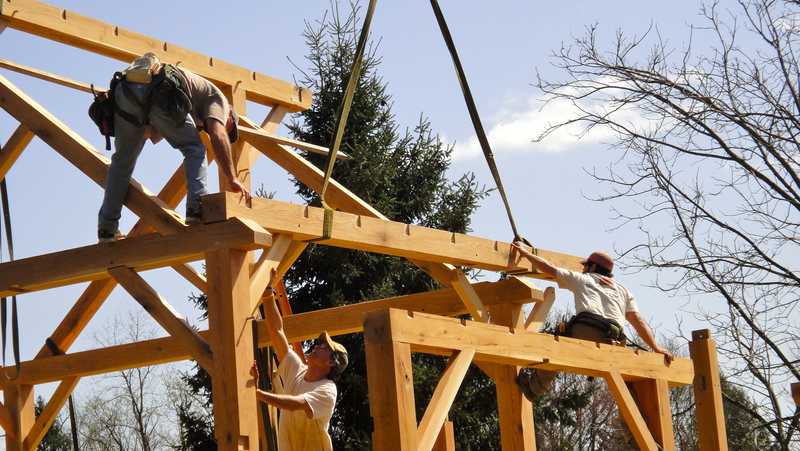 The major purlin and structural ridge bear on the king post trusses so, before they could be installed, the trusses had to be flown, plumbed and secured. 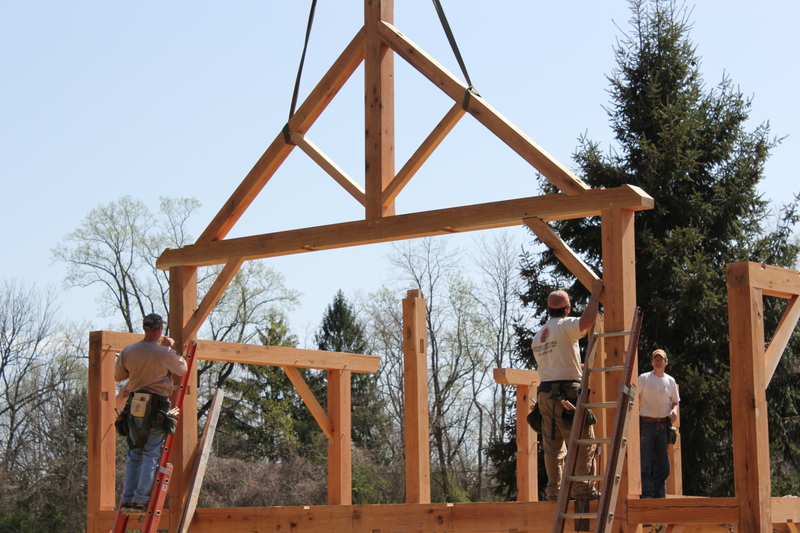 Upon the installation of the king post trusses, the major purlin and structural ridge were lowered into their final resting place. 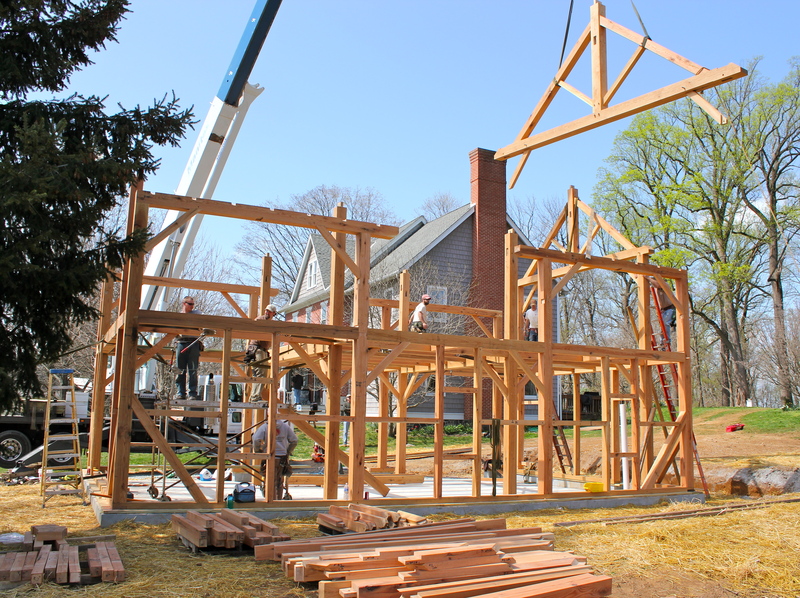 These members in this frame had to be installed piece-by-piece taking up crane time. 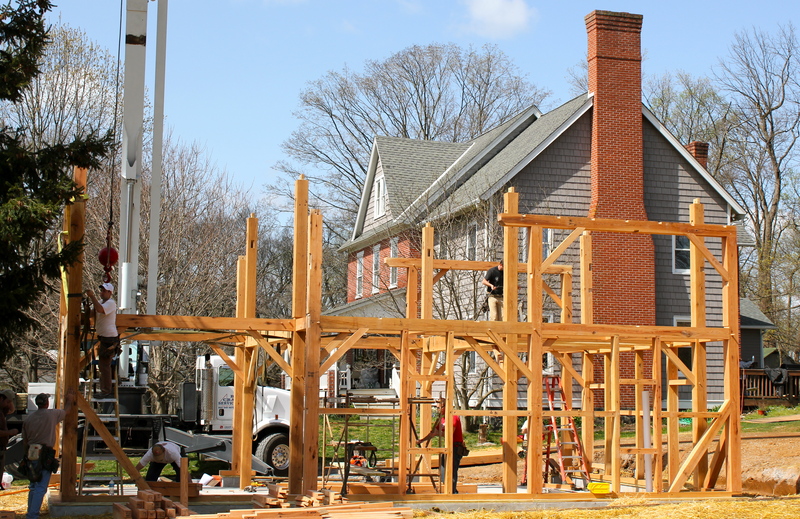 During this time, other members of the crew installed timbers, which were manageable by hand in another area of the building. 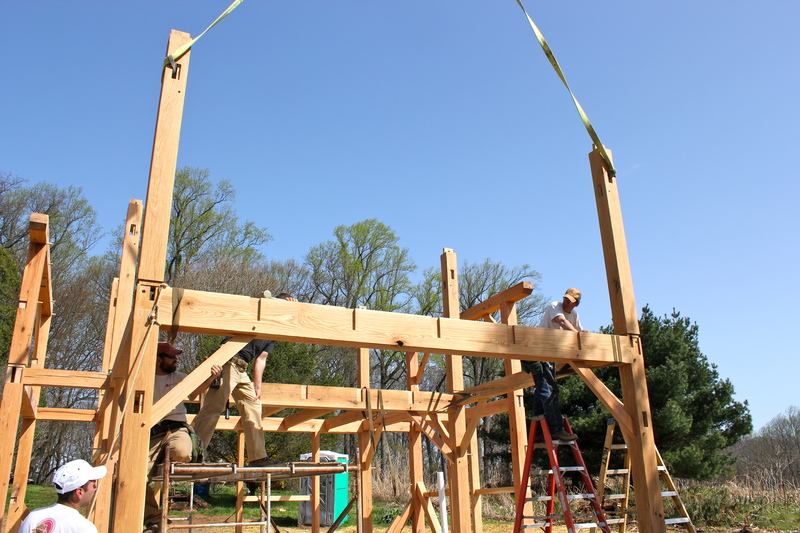 Among other timbers, the second day of the raising focused mainly on the roof rafter system. 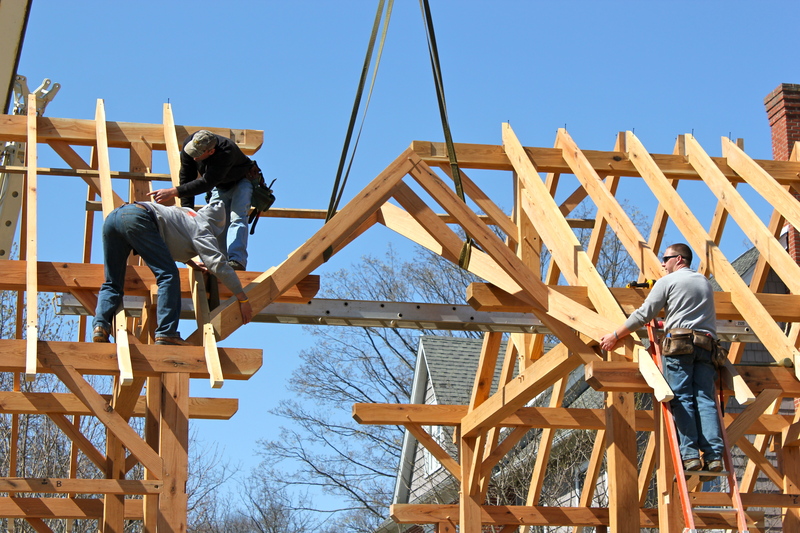 The dormers were put together on the ground as much as possible and were then positioned in place by the crane. 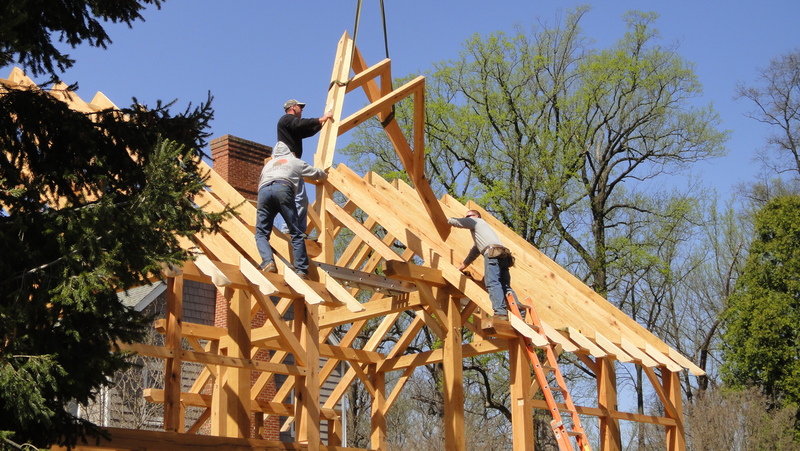 After that, the crew installed the smaller members completing the dormer. 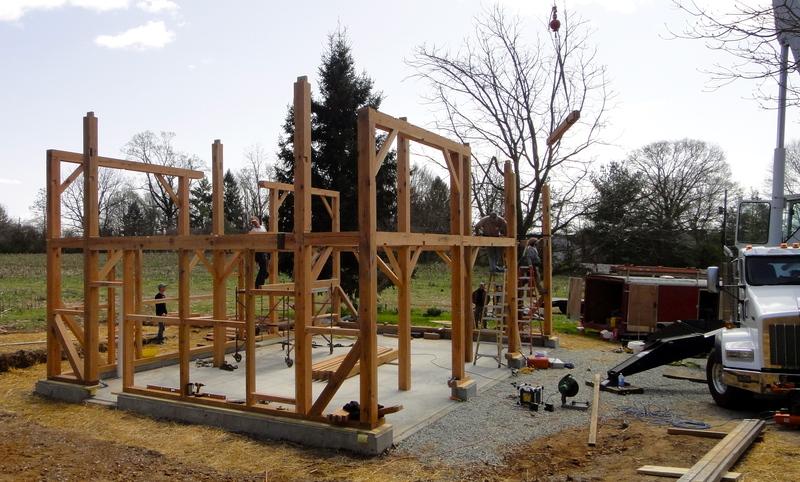 Below is the timber frame skeleton, which is currently being finished by our sister company, Hugh J. Lofting Construction Management Services, LLC. 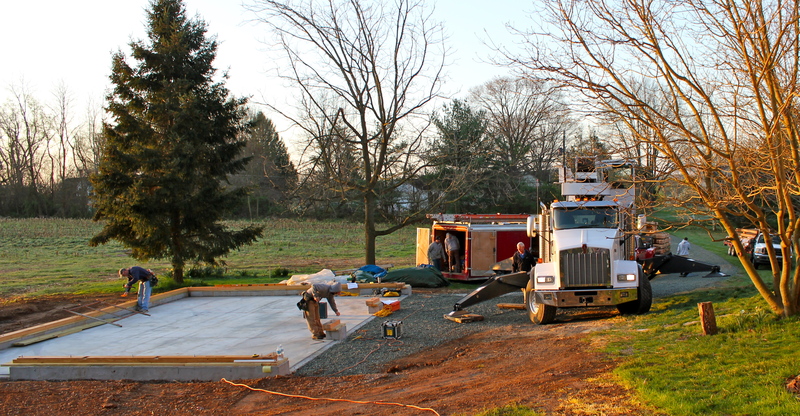 The HLTF crew is finishing the pre-fit of our new carriage shed which will be raised next Monday. 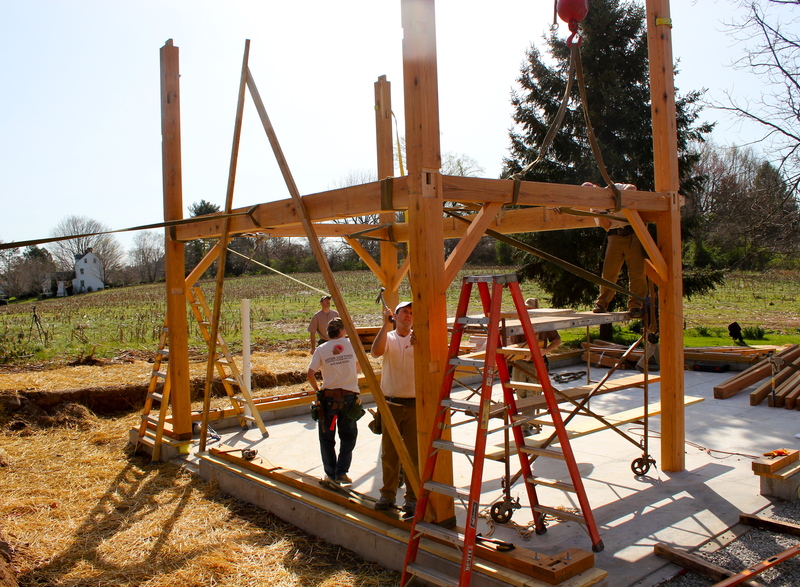 Here the crew is using the lift in our shop to help move around the large timbers. 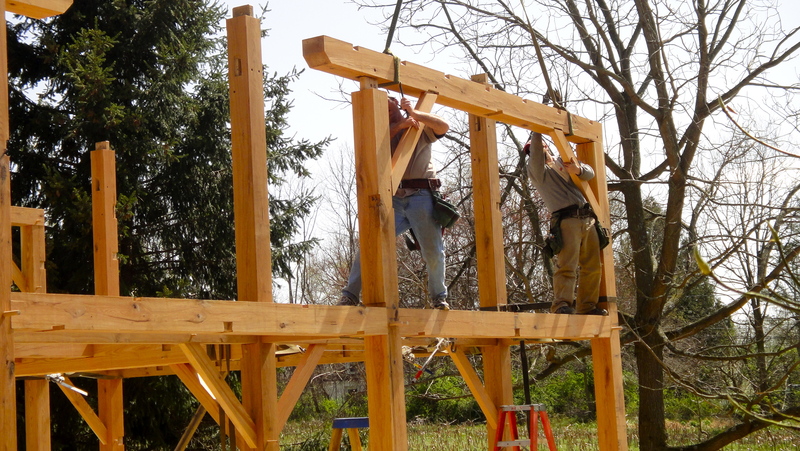 the rest they do by hand. 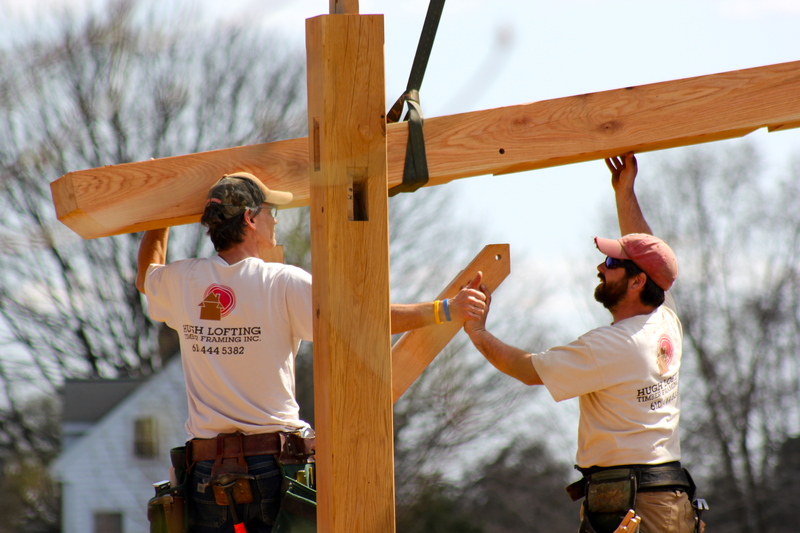 The reason the crew pre-fits is to make sure every all the joinery is tight and so there are no surprises when they get on site. 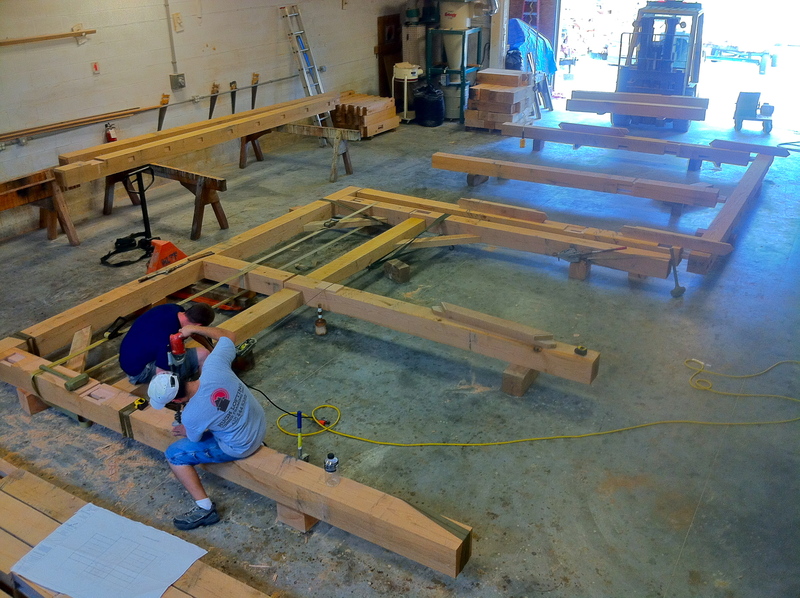 The guys are now finishing up the sanding and staining to be all ready for Monday. 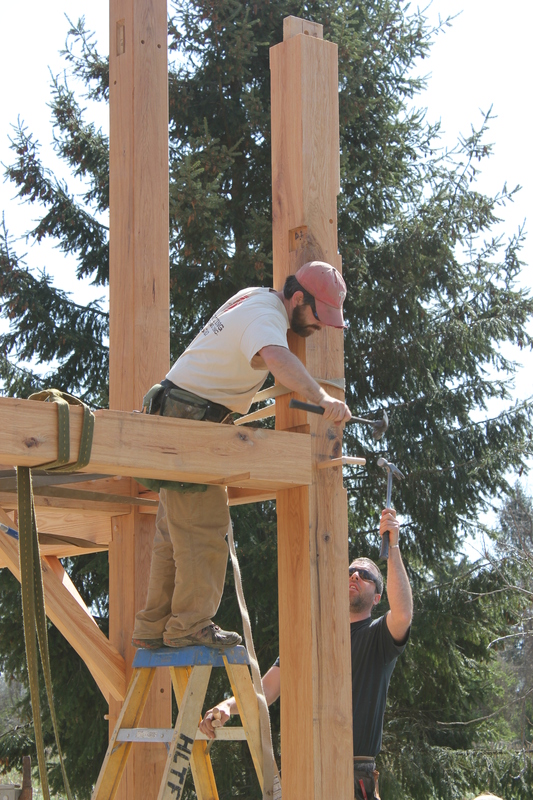 We are all excited for the raising event! 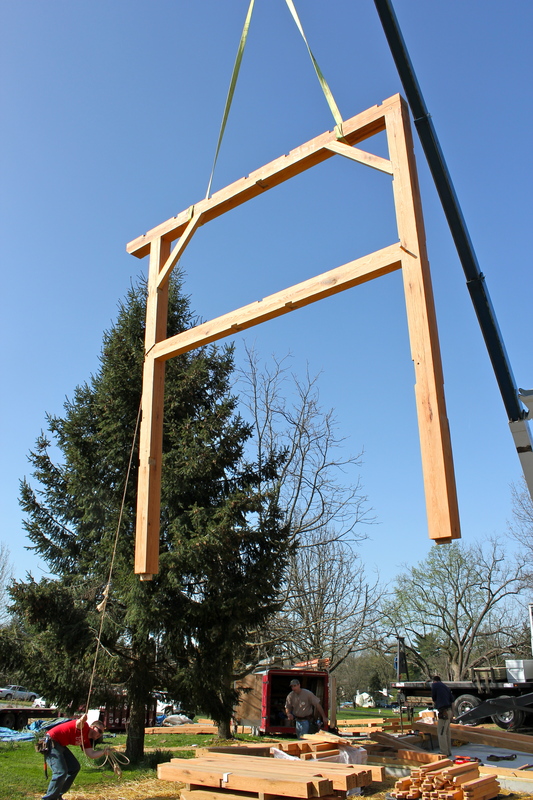 Check back for raising photos! 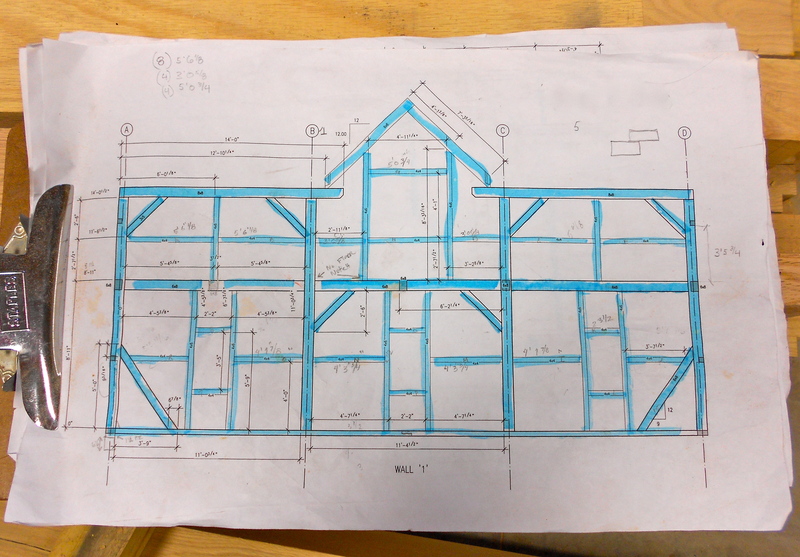 The drawing and the timber frame, pretty cool comparison. 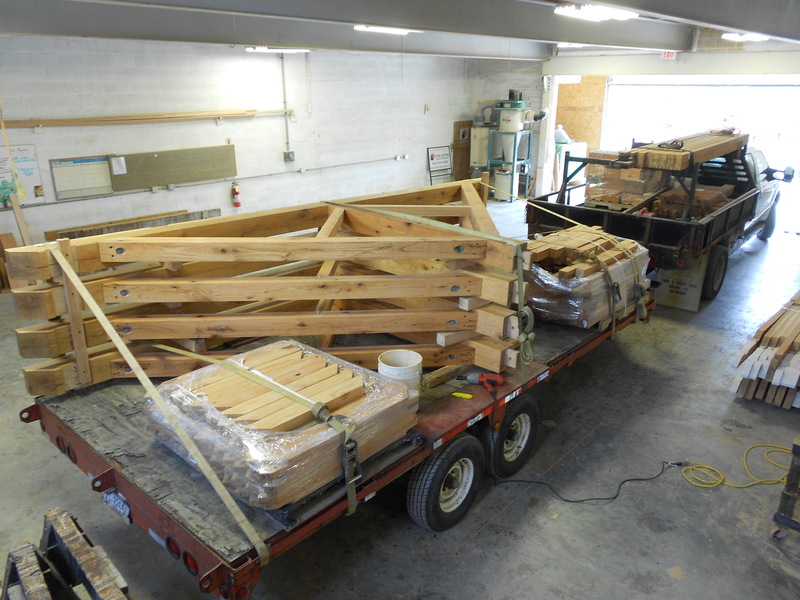 We had a delivery of beautiful planed Oak for our next project to enter our shop. 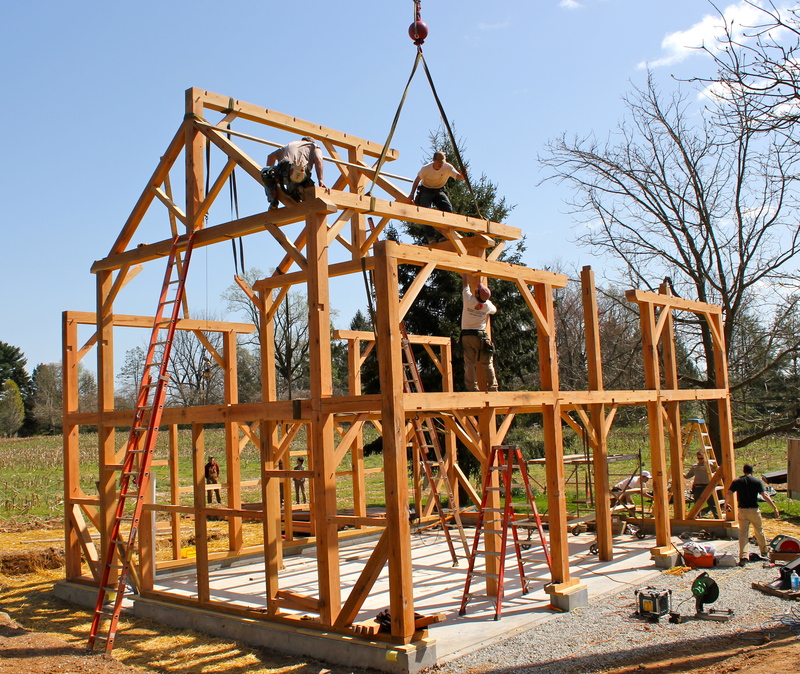 We love using Oak for our barns and outbuildings. 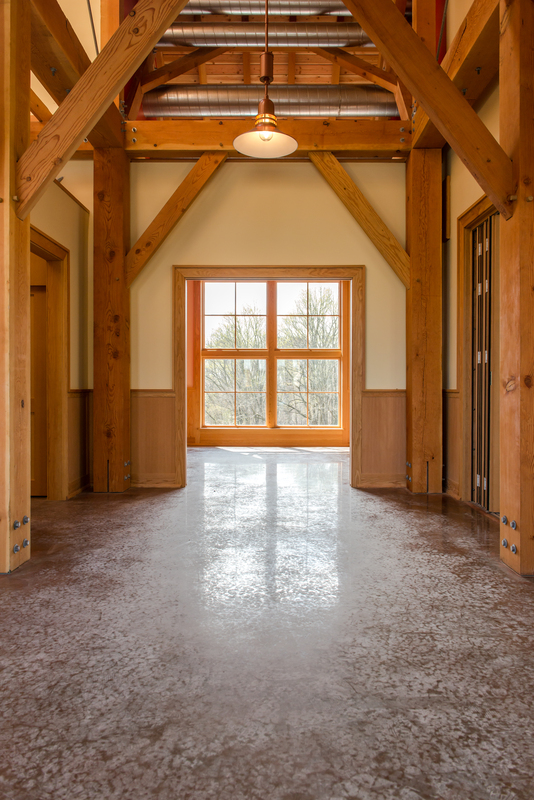 Oak is great because it is locally sourced and it ages perfectly in an unconditioned space. 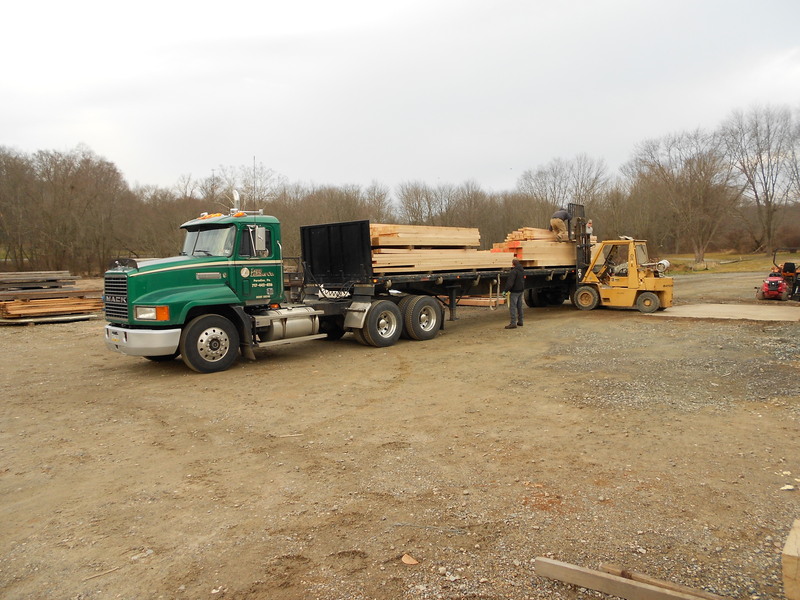 This Oak will soon become a new barn for a client in Kennett Square, PA. 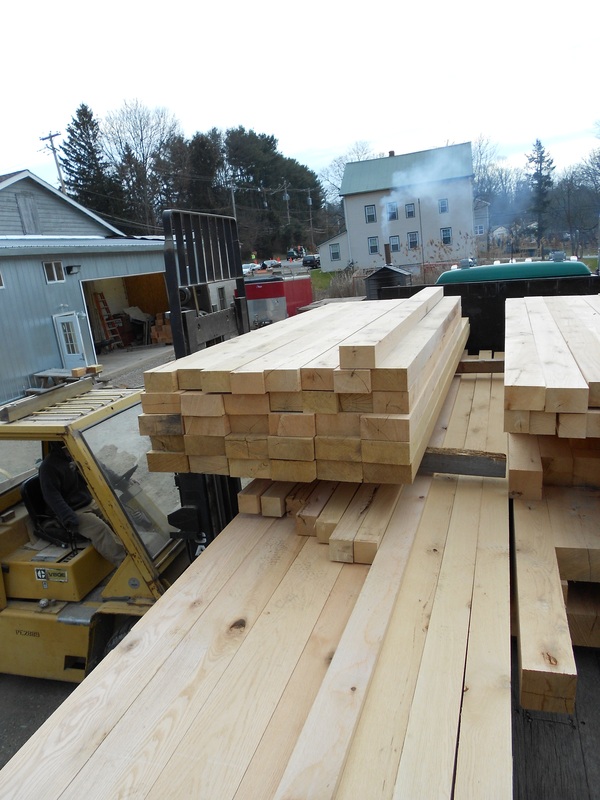 These timbers are already in our shop being cut out.